So! I've been excitedly waiting for the Zuru X-Shot Turbo Advance to arrive somewhere I could actually buy it. Currently, it's available in the US at Sam's Club and Bass Pro. Neither of those are great places to have to go for NERF-related stuff (One being a membership club store, the other having few locations), and living in the Pacific Northwest, neither readily accessible (We have loads of Costco's, Sam's hasn't gotten a foothold). Fortunately, I live in the one part of the PNW where Bass Pro is convenient so I went there and picked one up. 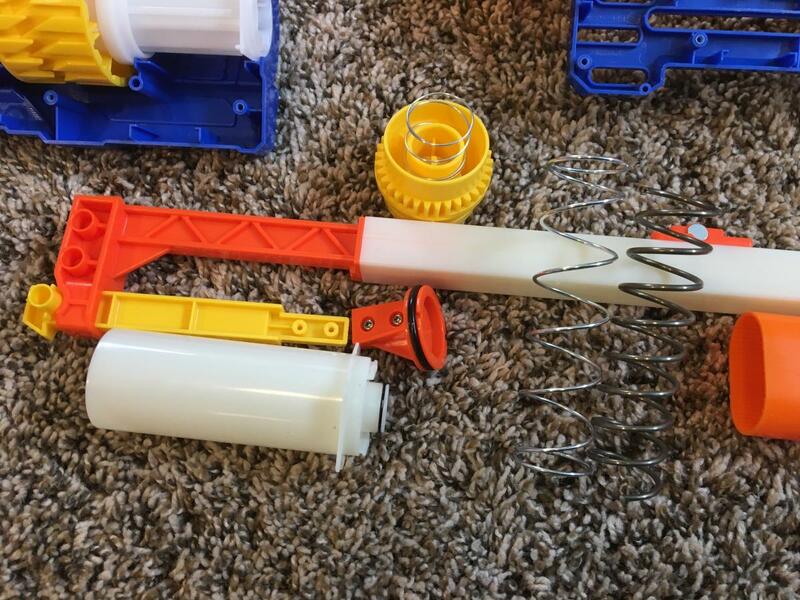 For those not following blaster news like I've been, it's a 40-round pump-action cassette/turret fed blaster. 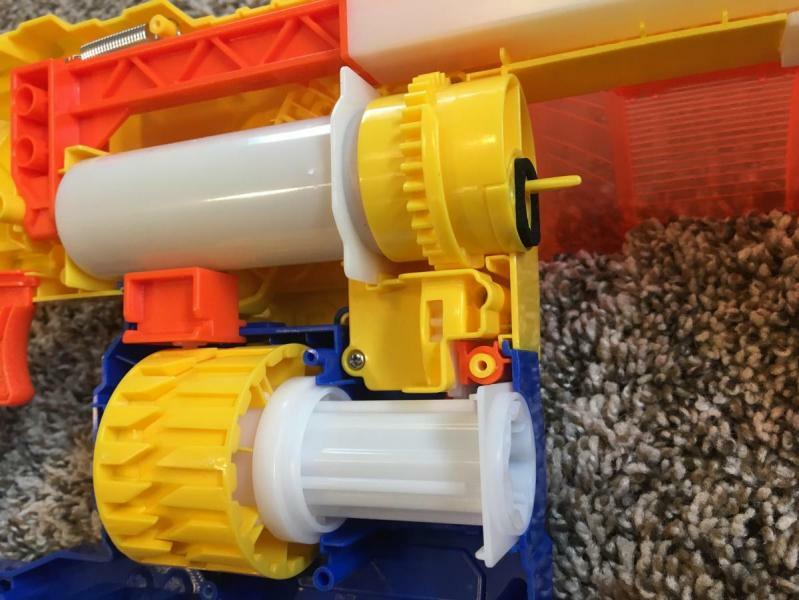 The turret is more compact than in it's contemporary, the Dart Zone Magnum Superdrum (slide action, 40 round turret), because the darts are in two rings of 20 around the turret and there is a switch on the side to rotate the AR around to feed one ring or the other. There are no locks on the action, so once primed you can rack it back to advance the cassette/turret. It is also "easy" to swap the turret (hence, cassette) by pulling the cassette lock forward and poping it out. I say "easy" because in reality, it is not something I'd want to do on the fly. The blaster needs some kind of guide to dropping the cassette in, and the rotation mech should be spring loaded to pop around the cassette index once it's in to really enable quick-reloading. But it can be swapped stock without modification (e.g. : early Magnum Superdrums), and so if Zuru releases cassettes or someone makes a 3d printed or CNC'd one someday, having a few cassettes on hand to swap during downtime or between rounds would be appropriate. Another note: I'm not sure I dig the wings. They look fine, but block the cassette if they aren't in just right. I'm also not sure they don't impair function - it's hard to tell where the cassette is in the rotation and to reload the last few slots with them in place without racking the blaster a few times. 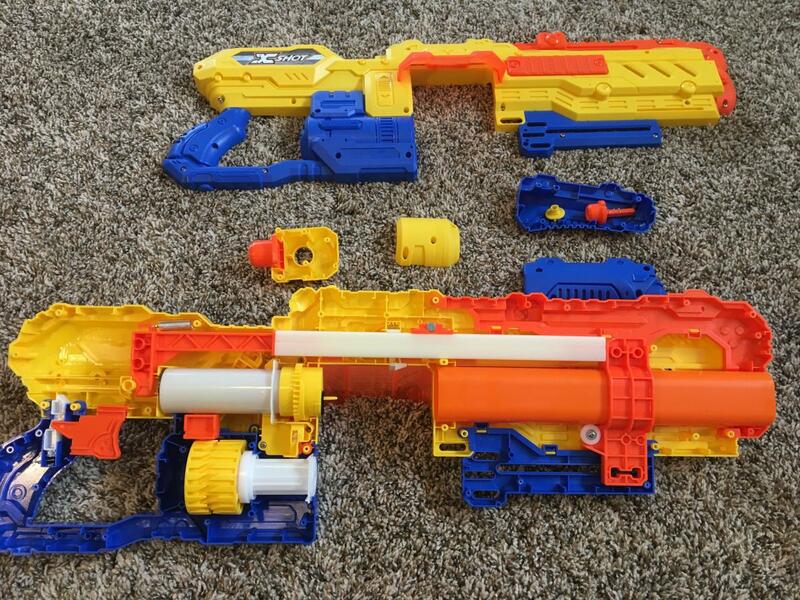 I may pull the left-side one off and leave the right, as the left one is the side the cassette rotates towards and I'm right handed so I'd hold the blaster and reload from that side. First pull off aforementioned cassette lock. Note lock button is a separate piece, pay close attention to how it goes back in then remove it. See this? This is the tricky part. It's not as symmetrical as it looks. Make sure the dots on the screw side of the cassette lock go into the depressions on the blaster, and the button nests cleanly in the lock housing. Also remove the pump grip. No issues here. Remove the shell half. I leave the screws in place as much as possible when disassembling blasters, for cases like this: I count 27 screws in just the shell in that picture. It'll make reassembly later slightly trickier than if the screws were out, but it's so much easier to keep the screws where they belong this way. Pay close attention to the position of your cassette-ring selector switch and the location of the AR. You'll need to put the AR back in and it needs to go the same way as the switch. If you don't remember or it got moved, put the switch in one location and the AR facing the same way. You should be able to test the switch with the blaster open like this. 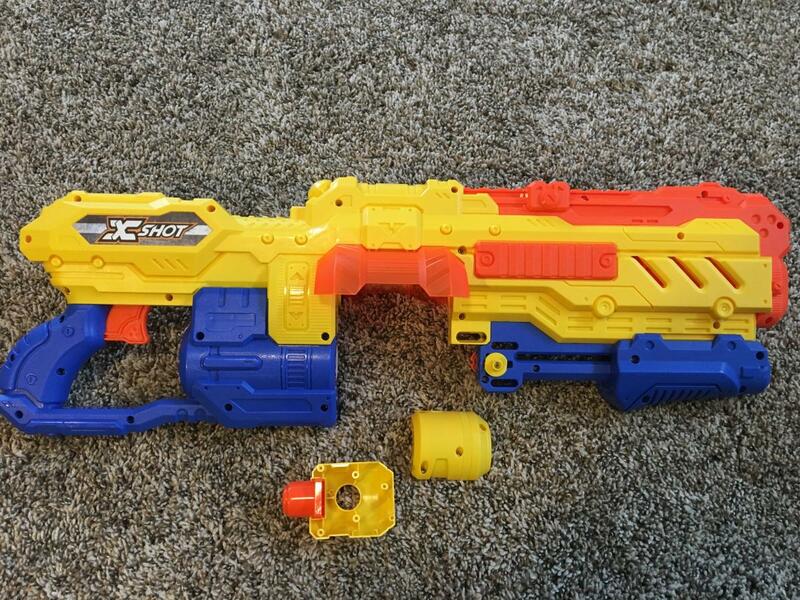 The actual guts of the blaster are mostly in one-piece and pull right out. Note also that the trigger isn't attached to anything. It'll give you some grief during assembly when it falls out on its own, but it shouldn't be too hard to set it back in place. For this guide, I'm leaving the turret parts in place. The orange turret advance piece fell out on me once, but it just drops in as shown. Here is the PT assembly disassembled. 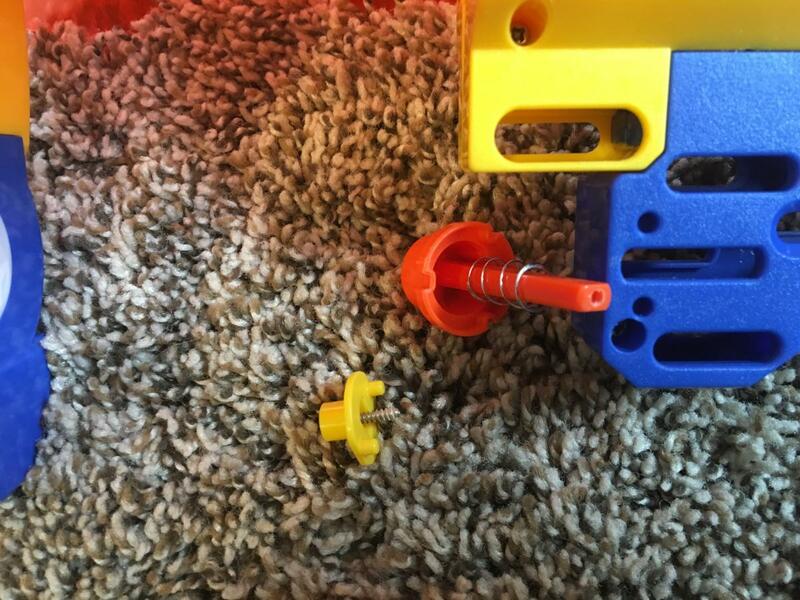 PT slides off the plunger no problem once it's out of the blaster and the AR is set aside. PH is attached to the PR in a nice mechanical plastic-part to plastic-part way, with screws to keep the two from separating. I'm sure the PT slides backwards through the pump assembly with the PH removed, though I did not test it for this guide. 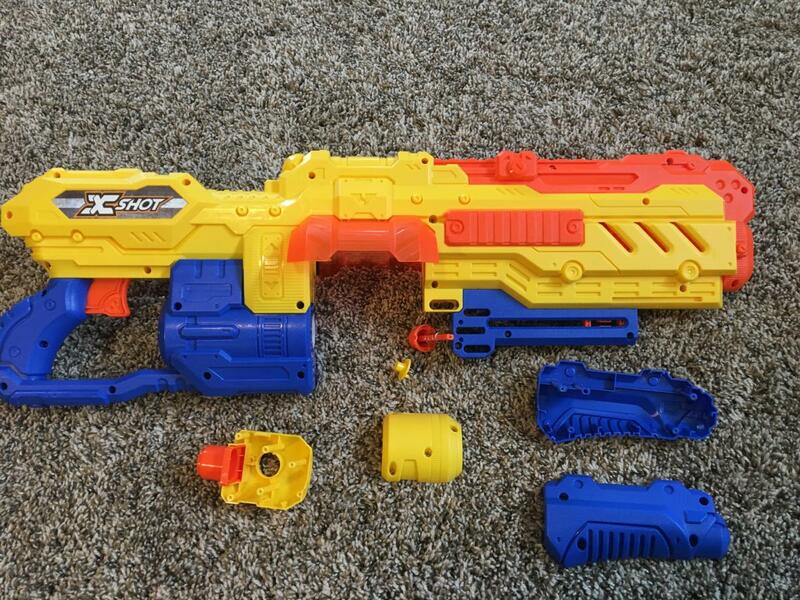 The spring that comes stock (left) is fairly weak, which prompted my disassembly of the blaster. 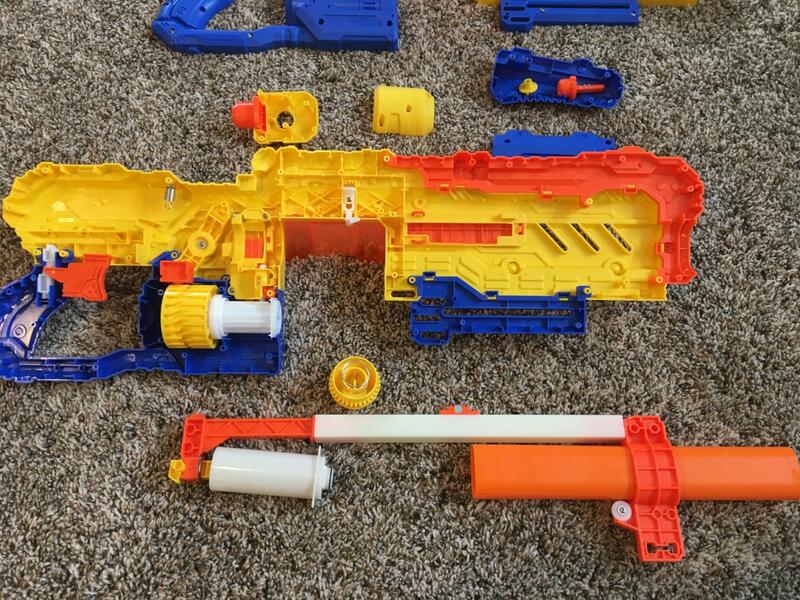 I was getting 1/3rd to 1/2 the range of my Caliburn or M6 with the stock spring, which is unacceptable (I believe my Retaliator and TTG's are more like 1/2-3/4 the range). Yes yes, range tests are lame, but I don't have a chrono and using the same dart for the test tells me about how much energy each blaster is putting out. It was significantly less in this case. So the [[[[k25]]]] (right) cut down to 8 loops (start at the cut end, draw a straight line that intersects the wire 8 times, cut the last wire that intersects; alternatively, it should be slightly shorter than the stock spring) got dropped in. I reassembled the blaster (reverse order of the picts) and then attempted to fire. Unfortunately for me, the catch isn't catching consistently, so I'll need to find a better catch spring and try again. At first, I thought the problem was spring length, which it probably was, but now that I've shortened the [[[[k25]]]] to 8 loops instead of 9, it's still not catching. When I get another chance I'll pop the blaster back open and drop a better/second catch spring in there and try again. 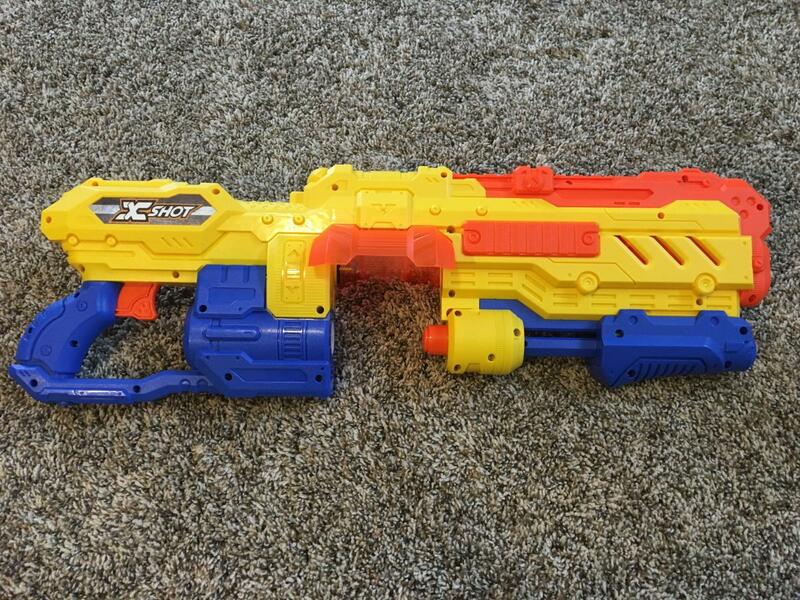 With the [[[[k25]]]], the blaster feels more powerful, but I can't test due to weather. I hope to update this soontm with more information and results as I have them. Only 2 months? Definitely a soontm update for me! Despite everything I've been up to, I felt bad leaving this blaster in an unusable state. So I took an hour and cracked it back open to get it running again. The K##'s weren't catching frequently at all, and upon reevaluation, I determined that the whole blaster is flexing when primed with one in. So I dropped the K## springs from the blaster, and instead removed the AR (which I also suspect was causing reliability issues with the drum) and popped another spring in there. I believe it's a Farshoot spring, but I don't remember for sure - I do know it is not a retaliator spring, that wouldn't fit. Normally double-springing isn't the best practice, but the stock spring has a giant diameter and the leftover springs I had on hand all fit inside it readily. Firing it inside, it feels & sounds more powerful (keeping with my extremely sophisticated testing practices). It also does not flex, which is definitely a plus. Edited by Meaker VI, 07 December 2017 - 05:59 PM.